A student who dressed as a chainsaw-wielding clown on a university campus has apologised amid rising reports of similar pranks. The self-described YouTube prankster, who gave his name as Kenny, said he was "only chasing his friends" in a video shot on Brunel University grounds. Meanwhile, reports of "creepy clown" sightings have continued to rise. Police have increased patrols outside some schools, and asked fancy dress shops to remove clown masks from sale. The craze - which involves people dressing up in clown costumes and scaring unsuspecting members of the public - has received widespread attention. More than 60,000 tweets using the hashtag #killerclowns have been posted in the UK since 10 September. Some, including professional clowns, have branded the trend dangerous and irresponsible. Media captionAre "creepy clowns" something to be feared or just a joke? Kenny, a media studies student, sparked panic on campus with his chainsaw video. He said he had used the tool in previous prank videos, and was filming with friends. But he conceded it "looked like he was terrorising" fellow students and that he should have informed people he was filming. "I regret filming so much on campus. I'm never ever doing that again," he said. Sightings of "creepy" clowns and reports of people in costume intimidating the public have been received by police all over the UK. Speaking to BBC Radio Cumbria, Supt Mark Pannone of Cumbria Police warned people were committing a public order offence if they try to scare others. 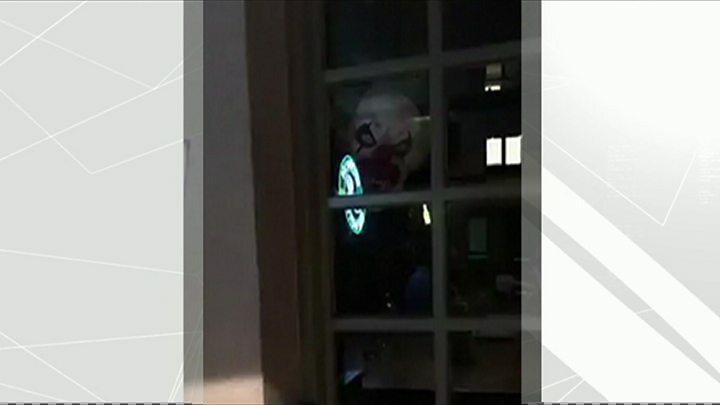 North Yorkshire Police received "at least" eight reports on the evening of 10 October, with people complaining of "young people dressed up as clowns, jumping out at them or chasing after them". They included youths dressed as clowns in Whitley Bridge, Selby, one "carrying what appeared to be a knife", chasing after a group of girls. 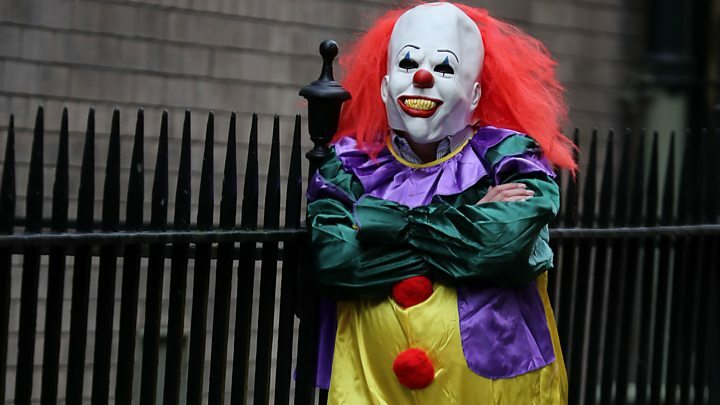 Essex Police arrested two boys aged 14 and 16 following reports of people dressed as clowns and scaring children in Wills Hill, Stanford-le-Hope. The teenagers were questioned and released without charge, but warned about their conduct. There have also been reports of people on social media discussing dressing as clowns and going to schools in Essex with a knife. 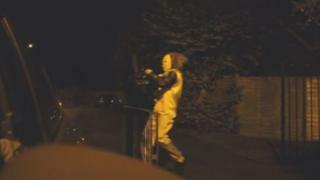 Cambridgeshire Constabulary said it received a call at about 10.30pm from a man who says someone in a clown mask with "possibly something in his hand" had jumped out at him in Woodston, Peterborough earlier in the day. "The informant punched him in the face," said a spokesperson. Kent Police say there have been 59 incidents involving clowns reported to them between 7-10 October, and that a 23-year-old man from Sittingbourne had been arrested on suspicion of a public order offence. In London, the Met said it knew of three clown-related incidents which had "met the criminal threshold". In the North East of England, police said they had received more than 200 reports of clown sightings, and 14 recorded incidents involving "harassment, alarm and distress". Vera Baird, Police and Crime Commissioner for Northumbria, told BBC 5 Live most of those stopped were aged about 16. "We've got officers now calling into schools. They're asking head teachers to tell young people that they shouldn't dress up as clowns now," she said. Officers from the force have asked shop staff to remove clown costumes from sale. "Our police... are going round all the shops and saying... it is unwise to sell these. Take them off sale for now and don't sell them to anybody because you'll just add to it," she said. Pupils at the Oasis Academy in Lambeth, south London, have been asked not to like, follow or share anything on social media connected to clowns following reports of threats. In a letter to parents the school stated: "It has been brought to our attention that there has been online threatening behaviour over the weekend from groups of people wearing clown fancy dress/masks. "We have notified the Metropolitan Police who have assured us that they are working with the appropriate agencies to eliminate this online threatening behaviour. The police will be present outside all Lambeth and Southwark secondary schools this afternoon." Thousands of people have used the hashtag #killerclowns with a surge since the beginning of October. It is believed the fad began in America before spreading to Canada and Australia and then the UK. The most interest in web searches for "clowns" was recorded in Essex and Northumberland, according to Google Trends. The horror author Stephen King, whose story It featuring a terrifying clown is being re-made by Hollywood, has called for an end to the "hysteria" on Twitter.